Sprinkle pork chops with salt and pepper. Spray large nonstick skillet with nonstick cooking spray. Heat over medium-high heat until hot. Add pork chops; cover and cook 2 to 3 minutes on each side or until golden brown. In small bowl, combine 1/2 cup of the broth and the barbecue sauce; mix well. Pour over pork chops; cover tightly. Reduce heat to medium-low; simmer 5 to 10 minutes or until pork is no longer pink in center. Remove pork chops from skillet; cover to keep warm. In same small bowl, combine remaining 1/4 cup broth, evaporated milk, sour cream and flour; beat with wire whisk until smooth. Pour into same skillet; cook and stir over medium heat for 2 to 3 minutes or until bubbly and thickened. Serve sauce over pork chops. This recipe can be prepared with 4 pork chops instead of 6. Serve the extra sauce over mashed potatoes at another meal. 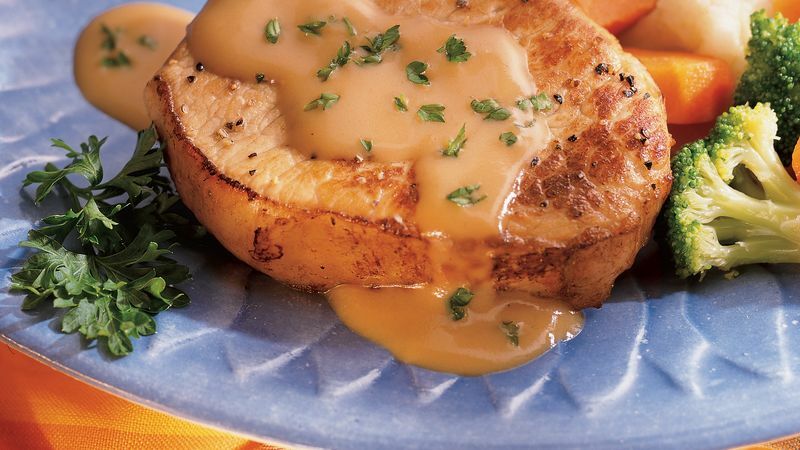 Garnish the sauce-topped pork chops with chopped fresh parsley or cracked black pepper. Mound a serving of mashed potatoes next to the pork chop on each dinner plate. Pour warm sauce over the pork chops and mashed potatoes. Add a side dish of steamed mixed vegetables.